Enter your information below and Brad will send this gift and his updates straight to your inbox. Aaron Klein (@AaronKlein) is the CEO and Co-Founder of Riskalyze. Founded in 2011 with 3 employees, today Riskalyze serves thousands of financial professionals who manage over $139 billion on their platform and employs 100+ employees just 5 years later. Aaron’s led the company to twice being named one of the top 10 most innovative personal finance companies in the world by Fast Company Magazine. He’s also been honored by InvestmentNews as one of the Top 40 Under 40 in the financial planning industry. This conversation with Aaron was a lot of fun as it was the EAB podcast’s first venture into Fintech. For those of you unfamiliar, I was actually a Computer Information Systems major in college, so this conversation allowed me to combine my love of finance and tech, Aaron didn’t disappoint! How do you scale a company from 3 employees to 100+ in just 5 years? This episode is brought to you by BombBomb.com. Yeah, you heard me right, that’s the name of a really cool service I’m guessing you’ve never heard of… Let me ask you this, how many unread emails do you have sitting in your inbox right now? Well, it’s the same for your prospects that get bombarded with emails every day… Enter BombBomb.com, imagine combining YouTube with your favorite email delivery system like Constant Contact, Mail Chimp, or InfusionSoft, well you’ve pretty much got BombBomb. I tap the app on my iPhone or log into their website (I’m actually recording this right now on their service) and after shooting a quick video, selecting the list of clients or prospects I’d like to send it to, and pushing send – my video is in their inbox with a couple of minutes with my video to click right at the top. YES, it’s that easy to actually get your message out there and communicated, nobody wants to read your emails! And by the way, it gives you all the analytics on the back end, who’s opened it, who’s watched the video and everything else you’d want to know. Conor over at BombBomb has setup a special offer for all the Elite Advisor Blueprint listeners if you’d like to check it out, just go to bombbomb.com/brad to take advantage of a free 2 week trial to check it out for yourself. They also stand behind their product with a 30 day money back guarantee, so really nothing to lose. To get started, check it out at bombbomb.com/brad. Scroll below for links and show notes… Enjoy! Alternatively, purchase it on Amazon here for an exorbitant amount of money! 17:00 Where are financial and tech efforts going over next 5 years? 33:00 How do you scale quickly and successfully like you have? 40:15 Any books that have been important to getting you where you are today? 46:25 What have you found to help the transition from 4 to 100 people working in the company? 58:50 Favorite book, as far as business, that you’ve read—why? A most gifted book? 1:00:00 Was Riskalyze your entire idea? 1:00:30 First memory of money? 1:01:40 When you hear the word success, who do you think of and why? 1:03:15 What’s one piece of advice you can give everyone on the call today that has led to your success? [00:00:25] Brad: Hey guys, this episode is brought to you by bombbomb.com. You may have never heard of them but here’s what they do. In fact I’ve been using them in my business for well over a year, couldn’t survive without them. So they take delivering a video in your clients or prospects inbox and they make it super seamless and easy. In the past if I wanted to shoot a video, share an idea, concept with my clients, I’d have to go to YouTube, upload it, copy and paste the picture in my e-mail, link it, it was just a ton of work therefore I just flat out, didn’t do it. Now what bombbomb does it makes it easy, in fact I’m doing this video right now on their service. Once I’m done, I will hit save, it will upload seamlessly on their website then I just pull up my clients or prospects that I want to send it out to, I select the list, I type a subject line put a little something in the body of the e-mail, hit send, it’s in my clients and prospects inboxes within a matter of minutes. Even better think about your inbox, it’s crazy right? It’s chaos trying to keep up with that thing. Well, imagine if now your prospects or clients they see your smiling face, they just see a play button, they hit it, they can now listen and watch whatever ideas you have to share with them in real time as far as face-to-face interaction as far as their concern most importantly on their calendar not on yours and it’s not all the work of having to read an e-mail that’s three pages long so guess what, it just flat out doesn’t get read. So here’s what to do if you want to check out this service, my buddy Conor over at bombbomb, he’s put together a special offer for you guys so it’s, “bomb bomb” as in it blows up, bombbomb.com/brad, go out there for a two-week free trial to check it out. He has put that together for all the Elite Advisor Blueprint listeners and by the way they put their money where their mouth is so if you don’t like the service after the two weeks you sign up, you pay for it, they have a 30-day money back guarantee as well. So once again bombbomb.com/brad, go check the service out, I guarantee you’ll love it. [00:02:36] Brad: Welcome everyone my name is Brad Johnson, I’m the VP of Advisor Development and Advisors Excel. In each episode of The Elite Advisor Blueprint podcast, it’s my goal to distill the best ideas and advice from Top Dot Leaders and apply it to the world of independent financial advising. In this episode I’m excited to have our first guest in the Financial Technology Space. Aaron Klein, he’s the CEO of Riskalyze and as the company’s co-founder his twice the the company to being named one of the World’s top 10 most innovative companies in finance by Fast Company Magazine. He is also responsible for helping grow the the three employees start-up into a company that employees over 100 just five years later. Riskalyze currently serves thousands of advisors who made a job over hundred and thirty nine billion, with B on their platform. We cover a ton in this conversation. Here is just the few of the highlights. First, how can advisors avoid constantly facing the pressure of underperforming portfolios? I know you’ve all had these conversations, that client that walk-ins upset because the S&P-500 did 15% last year, in your portfolio only return 10%. Aaron has a solution. Next, what is the one thing Aaron sees in the world of robo-advising that will always differentiate great advisors? In fact, He sees this as the biggest opportunity in the next 5 to 10 years in the financial advisory space. Finally, how do you a scale a company from three employees to a hundred plus in just five years? Aaron walks through his philosophy for building a successful team, as well as the one book he credits with much of how, he successfully built Riskalyze from the ground up. One final note, for those of you listening to this via podcast, this was originally live video call with my clients where Aaron and his team at Riskalyze offered a free gift. 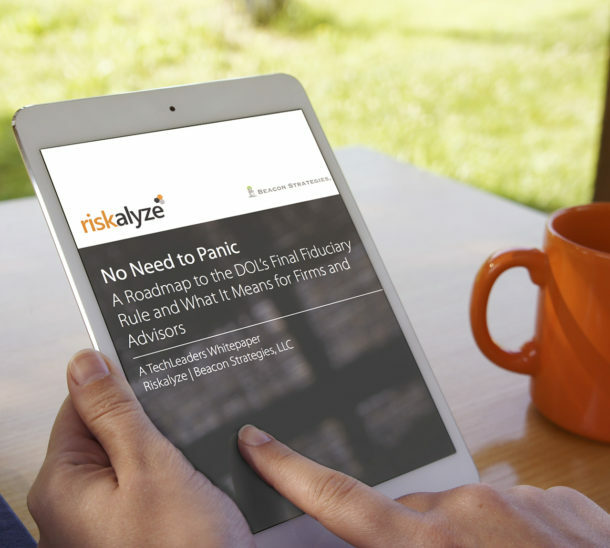 In fact, an incredibly timely free gift, no need to panic a road map to the DOL’s final fiduciary rule and how technology can bridge the gap. He has agreed to extend the offer to our podcast listeners as well. You can download it at bradlyjohnson.com/aaronklein, along with all the show notes, complete with links to all the resources books, and everything else discussed today. As always, thanks for listening and without further delay, my conversation with Aaron Klein. [00:04:56] Brad Johnson: Welcome Aaron, officially to the Elite Advisor Blueprint Podcast, thank you so much for joining us here today. [00:05:02] Aaron Klein: Excited to be here with ya. [00:05:04] Brad: Awesome, so this is gonna be a lot of fun today. For those of you unfamiliar that are tuning in either watching or listening. Aaron Klein is the CEO of Riskalyze as well as co-founder there…some incredibly cool software. We’re gonna dig into more about what it does and why financial advisors all around the country utilize it in their planning process but one of the quotes I heard in one of your interviews, that I’ll just use to describe it Aaron, and you can correct any of this when I get wrong. You said, “It’s kind of like, if you could google your ideal investments that go into your portfolios that really match up with your risk profile, I don’t know, do you remember even saying that? [00:05:44] Aaron: I sort of remember saying that a long time ago, haven’t used that when recently so you may have resurrected it. [00:05:50] Brad: That’s a good one. Sometimes the best one you forget have to come back to. [00:05:53] Aaron: That’s right. When we sort of started from a standpoint of believing that, individual investors have this challenge that’s rooted deeply in their psychology, we tend to sabotage ourselves as investors and we do it because of fear. We react to risk in a short term way, we make bad short term decisions and those hurt are long-term financial goals. An example what I’m talking about… I think it was Warren Buffett who said it best, “Stocks are the only thing that the American consumer refuses to buy when at their cheapest and only wants to buy when at their most expensive,” right? So when the markets are up, we feel optimistic, and excited and we want to put more on to this, we want to contribute more money to our accounts, we wanna get more invested, if that make sense. When the markets pulled back, we started getting a lot more fearful and if they pulled back enough, that’s were a lot of investors. Of course, everybody is different on how much risk they can handle. But when they pulled back enough, that’s where people get very fearful, they started making very bad short term decisions, they sell over, they go to conservative or whatever they do and they usually stay there until the markets feel safe again, which means that the recovery has already happened. And then they’re buying back in or going aggressive at the top and that’s just really disastrous for investors over the long run. [00:07:21]: So our belief was we invented these thing called the “risk number”, the idea that we can pinpoint how much risk somebody can handle in a quantitative objective way and then the advisor can use that to really build a portfolio that is aligned with the investor and turn that investor from a fearful investor into a fearless investor and when they become a fearless investor, it’s a little bit like goggling the investments to fit them and they’ve got a portfolio they can stay with for the long term, it is good for the advisor but it’s really great for the investor and their success as well. [00:08:02]Brad: All right Aaron. So, I like to call myself a “Riskalyze Rookie”, because I’m just really getting familiar with it. I know one of the reasons that Advisors Excel, we have a wealth platform and one of the reasons Riskalyze is a big part of that is, some of the biggest frustrations that I see as far financial advisors is, not the consumer side, like the software it’s addressing, it’s more on the advisor side where they build this beautiful portfolio, they build this beautiful plan and then a year later their portfolio has performed at 10% and the S&P-500 performed at… So everybody benchmarks, it seems like the S&P 500 is the typical benchmark in our industry. [00:08:50] Aaron: There’s only one time, when a client don’t benchmark against the S&P 500. That’s when it’s losing money. [00:08:57] Brad: This is true. [00:08:58] Aaron: S&P 500 is losing money. That is not the client’s bench mark anymore, they cut the clients, or saying, “We’re losing money. What’s the problem? They don’t seem to compare quite as closely when the markets are down. When the markets are up, the S&P 500 is typically is the benchmark. And that’s been a big part of the discussion as well. One of the things that we set up with Riskalyze’s, one of the key analytics is a portfolio will have a risk number and will have 95% probability range so we really train the advisor to not succumb to the temptation to put, to talk about the return of the portfolio because a very typical thing in advisor, well say, the advisor trying to focus the client on a long term, the client is pushing back and going “But what can I expect out of this portfolio? What should my expectations be?” and they sort of… finally the advisor capitulates and says something, “Over the long run, this portfolio should average 8% a year.” And of course, you know the client didn’t hear any of that except for 8%. That’s the only thing I heard. So if the market is down or below average, they’re going to say, “Why didn’t we make 8%?”. And if the market is above average… By the way, the one thing the market almost never hits is its own average, but if the market is above average then they go, “Why aren’t we beating the market? Why is the market beating my portfolio, Brad?”. [00:11:43] Brad: And that’s what I love. It’s the clarity of, “We’re not chasing some fictional number. This is your number that you essentially took a test that said, here’s where I want to be and it’s holding them accountable as well. [00:11:59] Aaron: And I think that it gets to encapsulate also the advisor leading the client to the right decision. We talk a lot about that in our training because the other thing that a lot of advisors say is, “Gosh, my client came in, they are 58 years old, they had never saved and they want to retire in seven years.” And the risk number comes back and they’re a 33. Well, that number probably isn’t going to work for them. That math ain’t going to compute. When we capture the risk number for the client that’s how much risk the client wants. One of the big jobs of an advisor is to say, “Well, how much risk does the client need to reach their goal?” And they’re able to use Riskalyze to answer that question. We’ll be able to say, for this client to reach their goal, they’re gonna have to invest more like a 65. We like to call it the “come to Jesus meeting” because it’s better to have that meeting than to have it three or four years later, when you’re trying to explain to the client. They’re nervous, they want to sell because the market is taking a dip and they are invested like a 65 when they feel like a 33. You want to have that conversation early while their psychology is in a good place so that when the market does dip, you can say, “Now, wait a minute. We agreed you weren’t going to sell out of this portfolio for fear because this is a normal kind of loss for this portfolio.” And that really helps the investor to stay invested for the long run. [00:14:19] Brad: To me, that’s the first half of the story but then the other cool part with Riskalyze is the fact that now in the back end, you’ve pulled in all of these data feeds that essentially show you, “Here’s the S&P 500’s risk number” or “Here is this mutual fund, this bond as well”, correct? [00:14:40] Aaron: Absolutely. So you can plug. 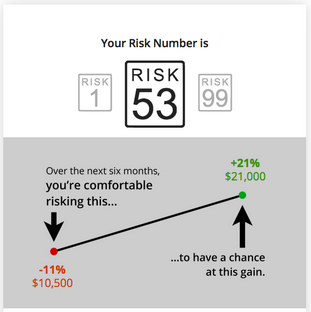 We’ve got about a quarter of a million investment choices in Riskalyze. There are great ways that you can pull bonds in and look at them in the context of what type of bond they are. We’re actually in the middle of growing out and upgrade the bonds in the near future that’s gonna add a bunch of individual bond coverage as well. Every US stock, ETF mutual fund, a hundred and thirty thousand, variable subaccounts, if you’re seen those walk through the door with a prospective client need to figure out that risk. 10,000 SMA third party money managers on the platform, a variety of non-traded proprietary strategies from different asset managers. If an advisor needs to figure out the risk of a portfolio, they’re gonna have those options available to figure that out. That technology gets used both for building the new portfolio but also for analyzing the existing portfolio because that’s a big piece especially when it comes to client acquisition. [00:15:37] Brad: What about cash under the mattress? How do you guys pull that one? [00:15:40] Aaron: Well, there’s nothing to say that you can’t create another account in a Riskalyze portfolio and put a hundred percent of that account in cash and show its impact on the portfolio. [00:15:52] Brad: And will it show the risk, inflation risk, and all of that that’s built into it? [00:15:57] Aaron: We build that into the retirement maps aspect that shows it overtime so that you can demonstrate… We had one advisor who said, “I’ve always had this client who is just stressed out about the risk of the bond market going down because interest rate is skyrocketing and the risk of massive inflation.” He just believed that both those things were gonna happen and I don’t know if he was worried that Trump was gonna get elected or what the deal was or it was the other way around, who knows, but he was worried about those kinds of things happen. What really calmed him down is, this advisor said, “I just plugged in an insane amount of interest rating increase into the model and then I plugged in an insane amount of inflation increase into the model and he still was at an 80% likelihood of success to reach his retirement goal.” And that gave him a lot of comfort that he’s gonna get there, he’s gonna be okay. [00:16:54] Brad: Alright. So, I’m just gonna throw you the first curve ball. Usually, I pull this out somewhere along so it’ll be in the technology and the financial band so you should be good there. What’s one thing in finance and technology or FinTech, as you guys like to call it, advisors just flat out, don’t see coming? Five years from now, ten years from now, as Wayne Gretzky says, “Where’s the puck going?” Thoughts there. [00:17:26] Aaron: It’s a great question and I think ultimately, advisors have, for a long time, felt like their value came from designing the pie chart – from deciding exactly how that client’s portfolio was gonna get allocated. Even at a very basic level. Obviously, there’s lots of unique situations the clients may be in where the advisor can actually create some value by putting that expertise to work. But there’s a lot of situations where a client has a relatively simple, straightforward life and they need a portfolio that is compatible with them along the risk number curve. But, at the end of the day, a lot of advisors are beginning to realize, “My value does not come from some unique way that I create that pie chart. I am never going to be able to somehow consistently beat the market. That’s not my goal as an advisor. That’s not what I’m trying to offer my clients. My job as an advisor, where I really drive value from my clients is being a behavioral coach, helping them make the right kinds of decisions, helping them get their assets titled correctly, helping them think through when it’s time to do a trust, helping them think through when I should buy, when I should lease. Be in that financial concierge. It just helps them make the right decisions at the right time. If I were to guess where financial technology is five years from now, I think that there’s way more advisors who work with a bigger wealth management organization to do a lot of that commoditized stuff at scale. We don’t need the billions and first new way to design a 60/40 portfolio. There’s ways that we get a scale out of that by working with a bigger wealth management organization to do that and advisors are going to focus their services where they really add value. Everywhere, from behavioral coaching to financial planning to tax assistance and just being that all-in financial concierge who helps their clients with their financial life planning. [00:19:46] Brad: So what I’m hearing you say is kind of more of that family office type approach where we’re integrating tax planning, we’re integrating estate planning, we’re integrating how we manage your portfolio. [00:19:58] Aaron: Those are the places that an advisor… I don’t want to understate how important the behavioral coaching aspect is. Probably, if an advisor makes X dollars, I would argue 80% of those dollars should be allocated to the idea of “I’m gonna help you make the right short-term decisions and encourage you to make the right short-term decisions when things get tough”. Because guess what? It’s really easy to be invested when the market’s are going up and to the right. If that’s how easy it was, we could all just jump on wealthfront and betterment these self-directed robos that claim to be advisors but they are not actually advisors. Those firms cannot help clients figure out how to make the right short-term decisions in times of stress. They can’t help client figure out complex situations. One thing that’s a really good signal… At some point, maybe the robots will become sentient and then we could actually have a real Robo Advisor that exist but I have yet to see a Robo advisor tell a client, “You know what? You actually shouldn’t invest this money. You’ve got $100,000 in student loans at a high interest rate, you should be paying those down. At your level of comfort with risk, frankly, you should have a cash reserve of this much before you invest.” Those are the kinds of answers that an advisor will give. I’ve yet to see any of the robots that exist today deliver that kind of advice. [00:21:39] Brad: Although you did just give me an idea. You take Arnold Schwarzenegger out of Terminator 2 and he can help you make some wise financial decisions. [00:21:52] Aaron: There you go! He will certainly be back. [00:22:26] Aaron: And I have to say, I’m a little bit of a contrarian, probably a little bit controversial when it comes to Betterment and Wealthfront but I actually don’t believe… The conventional wisdom is that betterment and wealthfront are cheap, that they push fees down and they’re really affordable. The thing is, Wealthfront and Betterment, these kinds of self-directed advisor products, they’re really just next generation e-trade account with a new coat of paint. And it’s fascinating because somehow they’ve convinced the market that they can provide self-directed investing services like a discount broker’s account at 95 in trade. But they can charge 25 basis points on advisory kind of fee and they can still get called cheap. The reality is, I think that is the most expensive way to be a self-directed investor ever. What you’re supposed to be paying for in an advisory fee is advice. You’re supposed to be paying, as you said, for protecting you from yourself and making the bad short-term decisions during times of stress that are out of the line here because your portfolio is probably out of alignment with what you can handle risk-wise. [00:23:39] Brad: That’s an interesting way to look at it. I like that. Because you think about, where did e-trade started at $14.95, I think. Then it was $9.95. I remember Trade King came out and then it was $4.95, and now Robin Hood, essentially, no fee. [00:24:00] Aaron: Because money is not important to them. [00:24:03] Brad: You know their company well. But that’s interesting because if you look at it as another version of e-trade, now it becomes incredibly expensive, it’s not a one-time fee, it’s a recurring fee. [00:24:17] Aaron: Because what they’re doing is they’re bundling together a series of transactions for you to do. Whereas e-trade, you would have to go in and enter in those ETF’s you want to buy and then you have to go in and you would definitely have to do the work of selling your winners and buy more of your losers and rebalancing your account to fit that portfolio. There’s no doubt that there’s some automation that they’ve done there but the reality is you’re still a self-directed investor. It’s gotta be the most expensive way ever to be a self-directed investor to pay an advice fee and not get any advice. [00:24:56] Brad: I like that angle. Makes you stop and think. Alright, we’ve got a few questions here. I wanna throw another one at you. Obviously, this podcast is for financial advisors. Something that I was thinking about, so you started Riskalyze in 2011, is that right? [00:25:20] Brad: And how many employees when you guys were just straight out of the gates? [00:25:23] Aaron: Three. It started with 3. It was me and two engineers. [00:25:29] Brad: Nice. Sounds like an amazing time. [00:25:32] Aaron: It was an amazing time and it was a simpler time, that’s for sure, but it was an amazing time.The three of us worked out of our homes for the first year and a half or so. We fought bad internet connections and everything else but we would just sort of camp out in my home office and work on product, work on core technology. We actually had a very different strategy when we started. We didn’t believe that great advisors would road tests brand new risk technology on our clients, at least the great advisers that we really wanted to have as customers one day and so we said, “Oh gosh, we’ll probably get to serving advisors in 2015 some for of year like 2015 and because this was 2011. [00:26:20] Aaron: And we said we’re gonna focus on consumers at first, were gonna focus on these guys who put 25K into an e-trade account. So we built out on the core technology, built this free product for the web that helped that kind of investor come in, figure out the risk number, figure out how to re-balance each rate account or whatever brokerage account they had into something that fit their risk number, and so we sort of launch that product tale end of 2011, early 2012 and that was our year of successful failure, the success part was, we got great PR, Barrens, New York Times and NPR. We had users come in and built 2 billion dollars of portfolios on the product that was after we took all the billion dollar portfolios because we were pretty sure Warren Buffett wasn’t using our website. Average account size $27,000 these were the e-trade guys. They’re loving the product, they’re in there doing, really resonating with the consumers. The failure part of that year was monetization, we were trying to partner, and build this technology into the website of one of the five big discounts brokers, that was sort of the plan. Because, I think this is pretty close to an average number across all of their businesses, but those discount brokers have a really interesting problem. 93% of their funded accounts haven’t executed a trade in the last year. This is not buy and hold, this is buy and ignore. [00:28:51] Brad: So this is an online broker? [00:28:54] Aaron: This is labor day 2012, and we had about three months of cash in the bank at that point in time. I was thinking that we were hitting the brick wall at that point. But, came back from that meeting, got the team together on Labor Day weekend 2012 and we just said “Let’s take a last effort and see if we can’t leverage… rebuild the product for advisors.” The one thing we have on the ship that’s good is the $2 billion of risk model validation that our users given us. So why don’t we take that to the advisor market and see if that make sense. It was still a lot of smoke and no fire for the next six months after that, but in March or April of 2013 we came up a beta, and just came worn out of beta and we haven’t looked back since. It’s been an amazing growth, as we’ve watched thousands of advisors come on the platform and we had four people in the company in March, April 2013. [00:29:58] Aaron: We ended the year with 10 and we ended the next year with 25 and then today it’s about hundred people in the company. [00:30:05] Brad: Alright. So, I’ve got two questions I have to ask, for a follow up there. First one, I was thinking this as you were explaining it. I worked with financial advisors for close to a decade and it’s amazing everybody has their simplified way of talking through risk reward with clients. And essentially what you did, was you created a smart rule of 100. You took the rule of a 100 and I’m sure everybody on the call knows that. But then, you made it smart and then you pulled in all the data on the back end to validate the rule? [00:30:44] Brad: It’s very cool to me how you took something that the financial services space is probably been using since the beginning of its existence and then you just…you bridged this gap which is a very good start-up. You find this really big problem that nobody solving right and you go attack it. [00:31:02] Brad: I just love how you took a simple idea and you made it very easy for an advisor to communicate it to a client or prospect. [00:31:08] Aaron: What are the things that we thought of through that thing is… You looked at how self-directed investors are doing it. You said basically they’re just doing it in a vacuum. They don’t know what they are doing. Well advisors are a little bit more knowledgeable than that then we start looking how advisors were doing it. And the typical approach was a paper based questionnaire. We’re sort of starting with “What is the investors stereotypical risk capacity?” If they’re young, they are probably aggressive. If they’re old, they’re probably conservative. And then we ask them some different questions and the questions are really fascinating because they are not actually risk tolerance questions in any shape or form. They’re market sentiment questions. So questions like do you get a thrill out of investing? I’ll tell you what I got a far greater thrill in 2013 than I got in 2008. And then we nudge the stereotype about that clamp one way or the other and we call that risk tolerance but it turns out our industry has sort of trained us to answer the right question with the wrong answer. And so, I think we sort of look that and said there’s an opportunity here. Today, it’s as if a contractor and an architect are sitting down with each other and saying so what the client really wants is a moderately conservative hallway leading to his moderately aggressive bedroom. And you know, if that’s how they did things when building a house, that house would never come together, they never build to make it right. We’d like to think that we’re putting the feet in inches. That rule of a hundred that you’re talking about, we really feel like we’re putting the feet in inches into this process of aligning clients with their portfolios and their expectations. [00:32:54] Brad: Yeah. I completely agree. It hit me, like they just took the most simple rule on financial services and just made it smart. [00:32:54] Aaron: I have to put intelligence into it. [00:33:05] Brad: So ok, so I want to ask a follow-up question because many of the advisors especially once you have some success your biggest issue is how do you build a great team. And so since we’ve gone from April of 2013 or we… I say we because I’m part of the Riskalyze team. [00:33:25] Aaron: We’re talking about it. Absolutely. Yup. [00:33:27] Brad: So Riskalyze has gone from four employees in April 2013 to over one hundred. That’s incredibly quick grow. So can you share…I’m gonna ask a few questions here take this whichever direction you want. [00:33:41] Brad: How do you scale that quickly successfully? What lessons have you learned? What’s been your biggest mistake? Just thoughts around that growth and how you been able to do it. [00:33:51] Aaron: Sure. That’s a multifaceted question so I’ve got a few different things that I can probably throw out there. Probably the most important thing is that we were self-aware enough to know that was gonna be a challenge early on. It was probably about June or July of 2013 that I sat down with my co-founder and I said ok, this is like all of a sudden it’s like a rocket ship that we’re strapped to the side of it and it’s pretty clear that we’re growing well and there might be a real business here so now we have to think about actually building a company right? [00:33:57] Aaron: Up until now we’ve been a start-up and we’ve been trying to build a product that people would love and we seem to sort of hit that in bottled magic in some way…even greater than we could ever expect. And so now we actually have to think about building a company around this product and this sort of growing movement that we somehow attach ourselves to. Because it really felt a lot bigger than ourselves in those days of 2013. I would say it still does. [00:34:55] Aaron: So, one of the things we did…You know, we sort of struggled if you think about it right? Like 2011 was a tough year, the core tech took us a lot longer than we thought. 2012 was a tough year. We were successful on a number of fronts but we really failed on some other fronts with the monetization strategy. So I think when start-up’s struggle if hey ever come out of it, they often have this monthly collection of B and C players that they sort of patched onto the team along the way. And they’ve got to figure out how to build a company around that. And so here it is June/July of 2013 we’ve got about 6 people in the company at that time. And I looked at my co-founder and I said “You know, here’s the thing. We’ve got all A players like somehow we’ve got all A players of the company. So actually our job, our number one job is just not to screw this up from here.” And so we took some… we had stuck to the same mission the entire time since we started the company. We took our core values that we had pretty much stuck to the whole time. We gave a little bit of a refresh, really just sort of rearticulated what we meant by them. But then we just sort of put together some training around that and we decided even before we have great training for new people coming aboard on sort of how to do their job, that we were gonna have incredible training about what this company about, where we’re going and how we’re gonna get there. And that’s our mission and values training. I actually taught it yesterday, because I still teach it to every single Riskalyzer who comes aboard, we do them in classes now. There were 14 Riskalyzers in yesterday’s training. I’m sitting there going through helping them understand the mission of the company is on, why we exist, what we do for our customers, but more importantly, how are we gonna work together. [00:38:01] Brad: Conflict isn’t necessarily a bad thing. [00:38:04] Aaron: Conflict isn’t a bad thing, conflict about ideas. Interpersonal conflict, we push people to use open direct communications to solve that as well in a really transparent way. Conflict over ideas is a good thing and that’s something that helps the company move forward. We also do a lot around accountability, teamwork and ownership. And we talk about ownership particularly, we want everybody to own the part of the company that they run and think about their jobs in terms of inputs and outputs. The entry level team that we have literally thinks about their job as owning instead of outputs. And I make the point, that way if there’s something going wrong in the area of the company that you own, you’re able to…you know to sound the alarm early on cause guess what I can’t, I don’t have day to day visibility in what you do anymore. So I can’t raise the alarm and said there’s something wrong here. I used to be able to that when there were four people in the company, five people in the company right? It was easy for us to know what was going on and stay aligned because we just say, “Hey everybody,” and we walk in the middle of the room and we talk. Well it’s a lot more complex of an organism now. And so… I think just setting those kinds of core values in the place of how we are gonna work together. Choosing to be a place where open and direct communication is how you work. I think that has been a big part of why we’ve grown the way that we’ve grown and been able to scale the organization because you know I had one person tell me in the latter part of 2013, this is a really a weird organization. Like really? Tell me more. [00:39:43] Aaron: And he said, “I’ve joined a lot of companies before, I’ve always gotten really great training on how to do my job. Here, it’s like you pushed me into the deep of the pool and said I really hope you know how to swim. But on the flip side, I’ve never felt more connected to where the company was going and how it was gonna get there. I understand what mission we’re on and I understand how we’re gonna work together to accomplish the mission. And as a result, I can be a million times more effective in what I’m doing.” And for me, that’s just spoke volumes because that’s what we’re trying to put in a place to help us scale in our organization. [00:40:21] Brad: That’s awesome. So Aaron, do you have any books or other resources that have helped you down that path that’s lead you to how you lead the team now? [00:41:53] Brad: We’re just good. [00:41:55] Aaron: Yeah we’re just good. Ben Horowitz would just say, ‘Nobody was writing a management book, nobody was writing about how to lead a company when things are hard.” And the reality is building a company is one of the hardest things that you’ll ever do. It’s not checkers. It’s like playing three dimensional chess blindfolded. That’s sort of my perspective. It’s one of the hardest things you’ll ever do and understanding the perspective of how things work when things are not working well. I think it’s probably the thing that has helped me the most because there’s been a lot of moments along the way even though we’ve had lots of great growth and our growth has been really strong. There have been tons of moments along the way that were truly challenging and the work of building a company is unnatural. That’s one of the other things I had to learn from some of the stuff that Ben teaches because he says if you could just imagine, you ask me an interview question and instead of answering the question I just say, “You know brad the way you ask that question, your ideas weren’t organized very well. Why don’t you just go back work on that a little bit, come back to me and try that question again tomorrow.” That’s the kind of stuff you have to do as a CEO when you’re building a company, you have to get that kind of feedback to people and it’s very unnatural right? Because we’re wired as human beings to want people to like us. That probably comes in back from the cavemen days a long time ago. Ben likes to say that, the cavemen days because you certainly…if they didn’t like you they’ll eat you. It’s sort of wired in to us to want other people to like us. I think that’s so true and it’s a very unnatural job to build a company and lead that process. That’s been a big learning experience for me and that’s probably been the number one… I love that book and I reread it all the time because it’s helpful for perspective. [00:43:56] Brad: Thanks for sharing that. I’ve heard of it I have not read it. [00:44:01] Brad: I’ll definitely check it out. Your comments made me think of a book I’m actually just finishing. The Five Dysfunctions of Team by Patrick Lencioni. [00:44:11] Aaron: Patrick Lencioni. One of my favorites. Great guy. And I would summarize, if you could summarize somebody’s career in a sentence. His thing is all about like organizational health right? It’s just a lot of true stuff about how organizations have to be healthy to be able to function. I absolutely love that book. And I’ll tell you a funny story in an organization that I worked in before. That was very much a dysfunctional organization okay? Early on in my tenure with that organization, I saw all these dysfunctions and I said, “Oh my gosh, this is like right out of this book.” It was a little bit of self fulfilling prophecy because like I took the book in and I was photocopying a couple of the pages of it for my boss because I wanted her to read the book and I was gonna give her the book but I just wanted to wet her appetite with a couple of pages of the book right? So I’m photocopying this and she comes from the corner and sees me doing this and I tell her what I’m doing and she looks at the book she goes, “You can’t be seen photocopying a book that says The Five Dysfunctions of a Team in this office.” It was like right out of the book. It was so meta. It was just unbelievable right? I’m just saying. [00:45:27] Brad: That was your sign, this might not be the right spot for me right. That’s the first book by Patrick that I’ve read. I’m not gonna even try his last name, I’ll butcher it. What I like is how he takes this business philosophy but he puts it in story and it’s so easy to read. It’s just like reading fiction. It’s been a great read. [00:45:53] Aaron: That’s great. And what you’ll find in Ben’s book is that he does a similar thing and puts it all in a story, the bonus is that all those stories are true. It’s fascinating because there’s a lot of similarities both the ideas and the writing there and they’re both really great individuals. [00:46:12] Brad: Cool. I’ll check The Hard Thing About Hard Things out. Two questions on this. You said early on you had all A players. [00:46:28] Brad: What have you found going from 4 to 100? Do you have tools? Do you have systems? Do you have third party services that you use that allows you to keep on uncovering A players? [00:46:43] Brad: How do you approach that? [00:46:44] Aaron: We don’t have a perfect batting average on that but in the stretch the imagination but we have a really good batting average. I would venture to bet, I sort of do this little game at mission and values, I ask people to read of their employee number off their badges and at this point the highest employee number tells us that we’ve done about 170 hires in our history. Now we have one particular team that sort of inflates that because it’s an entry level team with a lot of college students that come aboard and work on that team. That inflates the number a little bit because it’s designed to be a short term job and so they go back to school and things like that. [00:47:26] Aaron: But nevertheless out of 170 hires we have maybe asked eight or nine people to leave the company over that course of time. To me that’s a signal that… first of all people when they get hired can feel pretty secure in their jobs because they know that we selected them really carefully and that we’re investing a lot in their success and that we’re gonna do everything within our power to make them successful before we frankly write off that investment. But at the same time how do we go through to the process of trying to hit that kind of high batting average. I would say that, I found out that one of the net effects is that we tend to go through a lot more candidates per hire than a typical company probably does. We ask a lot of questions focused on how have you done X in the past in your career? Because if you ask somebody can you do X, I can guarantee you they’re going to think that’s important to get the job and they’re gonna say yes right? And maybe add a little, if you’re really good they’ll add some intelligent color that makes them sound an expert of that. But if you ask them how have you done X at this company that’s on your resume and then you ask them to tell you a story about that. I got to tell you it’s an amazing interview technique because it absolutely weeds out the people who have actually never done it and have just studied up on how to do it. Versus the people who have actually done it and have a track record. Because guess what, all of those people, they are absolutely willing to tell you when there’s a piece of the question you’re asking about that they have it done ok? Because they’ve got so much strength in their experiences that they feel confident enough to be able to say “and I have not done that piece of the job before. That’s gonna be something I’m gonna have to learn. Here’s how I would think about that.” And now they’re sharing with you in a very transparent way what they know about process and what they’ve thought about that and what they’ve studied up about that. The other people who don’t have a track record to speak of or have not been successful frankly at the things that they are claiming to be successful at. Those people just talk process so you say tell me about a time that you did XY and Z at this particular job on your resume and they will literally respond to you with process. They’ll just talk to you well what you do in that kind of situation is you would hire this kind of person and then you train them like this and then you do this. It’s like why didn’t ask you how you would do it, I asked you how you actually did that. Like tell me the story of doing it at that company. We’ve done that a number of times and it always served us really well. To not look at…one of the lines I think it’s in the book actually I keep going back on this but I think it’s in The Hard Thing About Hard Things between Mark Andreessen and Ben Horwitz and basically Andreessen didn’t want to hire a particular candidate for a job and it was because he didn’t go to a top tier school and he doesn’t have this and he doesn’t have that and Ben Horwitz says to him, “Mark if he had those thre things that you’re talking about he’d be CEO of IBM” and Mark Andreessen said “Ok I got it, hire him.” That’s the kind of thing that I think you’ve got to look at when you’re trying to put together an A team, is what kind of strengths do you really need and not falling into the trap of hiring for lack of weakness but instead focus on hiring for strength. [00:51:45] Brad: Alright. So what’s the biggest mistake you made building the team so far? [00:51:50] Aaron: Biggest mistake building the team. Well, we have… I’ve certainly hired the wrong person before. I typically know it really quickly. We try to be very generous with severance in those kinds of cases. Its happened very rarely but it has happened a couple of times. I would say the other big mistake that I made along the way and again we fix this pretty quickly, I would say that we created the opportunity for political behavior because we wanted to be transparent and responsive to employees. And as the organization grew, its not that transparency is not a good thing, it’s not that responsiveness is not a good thing, but I’ll give you a great example. Right now it’s something I train our managers on, as a policy we will never match somebody’s competing offer that they get from another company. We seek to pay all of our employees, all of our Riskalyzers at market level for the job there in, for the skill set that they bring to that job and frankly for our budget that we can afford for that job but we try to triangulate those three things and come up with a market level rate that we could pay that person for that job and we sink that up for every Riskalyzer once a year on December the first. Now why do we do it that way because think about it this way, I want every Riskalyzer to know that they do not have to engage in political behavior to be treated fairly when it comes to compensation. I would say that we didn’t know that early on. We didn’t think about that early on so if your squeaky wheels are the ones that are always getting greased, get yourself ready for a lot of squeaky wheels, that’s what’s gonna happen. We put this system in place and said as a rule if somebody comes in with a competing offer, if they don’t love working here so much that they’re willing to wait a couple of months and have that one year sink up of their value and worth to the market happen once a year, they probably don’t have a long term enough perspective for us as an organization and we need to be okay with that with them leaving the company. So far to my knowledge we haven’t had anybody leave the company over pay because they know we’re gonna treat them fairly number one and number two they know that… they do not have to go out and do uncomfortable political things. It’s not who you know or who your friends with or how well you curry favor with that person or whether you go out and get a competing offer. That doesn’t set your compensation. It’s handled fairly in a pretty transparent and clear way. [00:54:32] Brad: I like that. There’s hints of Steve Jobs in there with what he did early on with Apple building the Mac team. It was more about the mission. [00:54:43] Brad: So being a tech guy, I’m assuming you’ve seen this, if haven’t you have to watch it. Have you seen Steve Jobs: The Lost Interview? [00:54:52] Aaron: The Lost interview…I feel like I have…that’s on Youtube isn’t it? [00:54:56] Brad: It was on Netflix. [00:54:57] Aaron: Oh no. I haven’t seen this. Ok I’m gonna check this out. [00:55:00] Brad: Yeah well, I was just… so originally you could stream it on Netflix then they took it off then I went, I was talking about it in another conversation I had and so I was gonna go out and buy the DVD because you use to be able to get it on Amazon,.. Now it’s like $150 because it’s out of print apparently. So I’ll find a way to find you one because I think there’s one floating around. [00:55:23] Brad: But he talks a lot about… I wanna bring this back to the interview. He talks a lot about how he built the Mac team and how it was more about the mission and the team and it’s kinda like Kennedy says we’re putting a man on the moon by the end of the decade. [00:55:42] Brad: It’s a mission and getting everybody pointed towards that common goal. [00:55:46] Brad: I see pieces of that with how you guys build and train the team and hey it’s not about XYZ company over here offering 5 or 10 grand more in a year. It’s about what we’re trying to do here together collectively. [00:56:00] Aaron: Right and I never wanna ask people to I guess I’ll say be charitable to their job right? And work for less than what they’re worth. As much as we believe in focusing our people on mission. We believe in compensating them fairly but I think that what’s interesting is to believe in compensating people fairly has led a lot of companies to create a system that is inherently unfair which is you need to go get a competing offer or you need to curry favor with someone in order to be compensated fairly. And that takes people’s eyes off the mission as you just said. I think that’s the most important thing. When you can get that out of the way and let people stay focus on the mission, they will. [00:56:42] Brad: Cool. Alright so we’re getting towards the end here and as always I have way more questions to ask than time for. [00:56:49] Aaron: I’ll try to be faster. [00:56:50] Brad: Ok yeah just speak… you grow up in the 80’s right? [00:56:55] Brad: The micro machines guy of the commercial just go into that mode and we’ll be good. [00:57:01] Brad: Okay so what’s your favorite advisor’s story from someone that you use to Riskalyze and they said, this client got it or just tell me some of your favorite stories utilizing that face to face with the client. So the adviser takes the meeting, they do the risk number, the guy is at 23, they analyze his portfolio turns out he has invested like a 68. He’s got so much downside risk, this guy’s face turns white as a sheet and he signs that form right there in the office that day 2 million dollar account like that. That’s the kind of story that we see the risk number creating for advisors over and over because it’s not all about generating revenue although its certainly has been a great client acquisition tool for them. It’s about getting that client aligned with where they need to be and what their expectations are because that drives, that turns a fearful investor into a fearless investor and that’s just, that’s we’re all about. [00:58:43] Brad: That’s cool. So alright, so with the handful of minutes we have left here. [00:58:49] Brad: Are you ready to go into a rapid fire questions? [00:58:50] Aaron: Let’s do it. [00:58:51] Brad: Alright cool. So I can tell already you’re a well-read guy so let’s just start there. Favorite… I’m gonna exclude the book you’ve already given. [00:59:01] Brad: Favorite book as far as business that you’ve ever read and why? Secondary question on there, I’ll give you the chance to think. [00:59:11] Brad: Is there a most gifted book that you’ve read and why? [00:59:15] Aaron: I’m gonna have to give both to I hope I’m stating the title correctly but it’s the…I call it the Blue Ocean Book. [00:59:24] Aaron: Which really help me think and learn about competition. [00:59:28] Brad: The Blue Ocean Strategy? [00:59:29] Aaron: The Blue Ocean Strategy, thank you. And I mean just a great book to think about competition and how to think about that because you don’t want to be swimming in the red ocean of bloody competition. You wanna figure out how you can be a blue ocean company and sail into a bunch of free opportunities to serve customers. If you look at what we’ve done with Riskalyze, we’ve executed a blue ocean kind of strategy there. [00:59:56] Brad: Cool. I’m really tempted to try a new question out on you for the first time. [01:00:02] Aaron: Give it a shot. [01:00:03] Brad: Ok let’s do it. Because… Now was Riskalyze originally your idea, the concept of? [01:00:11] Aaron: I don’t want to take, I don’t want to take full individual credit for that. Couple of different people. [01:00:16] Brad: Ok so because of the fact that you’ve got this very cool concept of how you look at risk. What is the first memory of money that you ever remember? [01:00:28] Aaron: First memory of money that’s a great question. It was probably when I first asked my dad how much money he made and he laughingly said that’s not something kids need to worry about. Somewhere along these lines but I also… it’s a little bit later and certainly wasn’t my first memory of money but I still remember when my dad gave me $5,000 to try investing. I’d should say he’d loaned me $5,000, the idea was I was gonna give it back to him with some return right? But it was 1999 and I kind of aged in this brilliant strategy of buying technology stocks. Holding them for a little while and then selling them and it was a brilliant strategy and I actually got busy you know, school restarting and all these kind of things, I got busy before the market crash happens so I was a brilliant investor in 1999 and if I had Riskalyze then I’d never would have done any of the things that I did but it just sort of worked out by random luck. [01:01:33] Brad: So there’s definitely some seeds in that memory to where you are today. [01:01:36] Aaron: There you go. Absolutely. [01:01:38] Brad: That’s cool. Alright so just a couple more here. When you hear the word success, who’s the first person you think of and why? [01:01:47] Aaron: You know probably my dad. My dad was… and my dad’s not like fantastically wealthy or anything like that but he was wildly successful in overcoming his personal challenges. He was an orphan. He was raised by family. He broke that cycle and I’m the oldest of six kids and he was an amazing dad for all of us and taught me everything I know about business. I had the opportunity to go to work for him in the afternoons after school starting when I was 12 years old and it was like an MBA course after MBA course after MBA course of learning stuff from him and so I definitely have to say my dad. [01:02:31] Brad: That’s cool. I should asked you that at the beginning. So your dad essentially gave you your first job? [01:02:40] Aaron: Yeah absolutely and definitely my love for business and he built a company from scratch ended up selling it to a larger competitor and I got to help negotiate that deal in 2002 when I was about 24 years old. It was just a fascinating experience to get to work for him for those 12 years. [01:03:03] Brad: That’s a high level of trust your dad’s given you there at 24. [01:03:08] Brad: Cool. Alright. So, let’s go ahead and we’ll wrap with this question. So what’s one piece of advice that you can give everyone on the call today that’s lead to your success? And so, our belief is if we just said yes to every single thing our advisors asked us to do, pretty quickly they would come back and say, “Hey this product is a mess like there’s so many knobs and switches, I have no idea how to use this, it’s useless, I’m done with this.” Our success has come from listening really carefully to what our customers are interested in. Trying to understand their interests and then try to engineer a solution that really delights them. And really goes way beyond what they might ever expect from simply doing what they told us to do. I really think that approaching innovation and approaching how you work with customers with delight rather than the customer is always right has been the key to why where we are at today. [01:04:56] Brad: I like that. Well, Aaron i just want to say from my side here in Topeka, Kansas. Thank you so much for clearing off an hour here to share with our viewers and listeners. It’s been a pleasure. [01:05:09] Brad: Thank you for your time. [01:05:11] Aaron: Absolutely, thanks for having me Brad. [01:05:13] Brad: Alright Aaron. Take care. [01:05:16] Brad: Hey guys this is Brad again. Just a few more things before you take off. Number one, seven technology hacks that financial professionals can use to reclaim unproductive hours every day. This is a free tool, I’m gifting you on my website bradleyjohnson.com. It’s available right on the homepage and includes seven tools, apps or other technology hacks. I’ve uncovered in the last decade or so of consulting the top financial practices in the country to allow you to put hours back on your calendar. There’s only one way to get it, subscribe to my free updates and it’s delivered to your inbox as soon as you do. Once again it’s available at bradleyjohnson.com. My gift to you for checking out the podcast. Number two, if you’ve listen to a few of my shows now and enjoy it, I’d appreciate you heading out to iTunes or Stitcher to rate the podcast and just let me know what you think, if you have ideas for future guests, please share them there as well. Thanks again for listening, I’ll catch you on the next show. This information is provided through a strategic partnership between AE Wealth Management and Riskalyze. Although AE Wealth Management may promote and/or recommend the services offered by Riskalyze, we do not guarantee the accuracy or quality of their services.